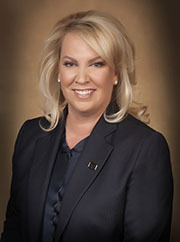 Message from the CEO and President | Aerojet Rocketdyne Holdings, Inc.
Hello, I’m Eileen Drake, chief executive officer and president of Aerojet Rocketdyne (AR) Holdings, formerly GenCorp. Welcome to our website. AR Holdings has a long and diverse American history that started 100 years ago in 1915. Our company’s products were at the heart of the Space Age and integral in our country’s efforts to defend itself and allies during World War II. Today, AR Holdings remains at the forefront of innovation and technological advancements in both space exploration and missile defense for the United States. AR Holdings' two main subsidiaries are Aerojet Rocketdyne, which specializes in propulsion systems for both space and defense applications; and Easton Development Company, which manages significant real estate holdings in Sacramento County, California. With a talented workforce of nearly 5,000 employees, AR Holdings has a presence throughout the country and around the world. Our customers and shareholders know that we pride ourselves on a reputation for integrity, quality and corporate responsibility in all we do. We maintain a strong employee ethics program and a commitment to safety and environmental stewardship through every facet of our business. You can read more about those focus areas in the pages of this website. I’m excited that our philanthropic arm, the Aerojet Rocketdyne Foundation, is dedicated to supporting education, with an emphasis on science, technology, engineering and mathematics (STEM), in all our communities. Since 1999, the Foundation has contributed more than $12 million to schools and nonprofit organizations through grants, scholarships and matching employee gifts. I encourage you to spend some time looking through our web pages to learn more about our company’s rich history, the important work we do, and the amazing people who make it all happen.